You know what? I think I’ll go shopping today! Traditional shopping is so passé, plus the weather is so hot these days, so I think I’ll just stay home and shop from my PC. I could cover more ground in less time! 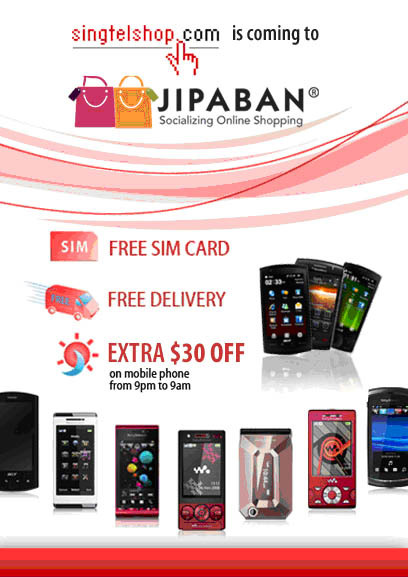 Ooh, I think I will go to Jipaban, the latest and coolest online shopping hangout! New places are so exciting! I shall sign up as a shopper and start customising my own mall. It’s like playing Mall Tycoon or something? I can create as many levels as I like and put shops I like on each level. How fun! Hey, after adding a shop in my mall, I can see updates posted by the shop owner! 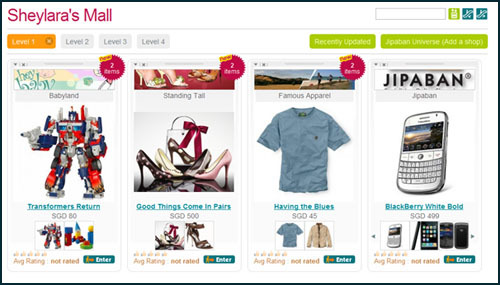 There are updates like new stock arrivals, promotions or just friendly hellos. This is kinda nice and non-invasive because the updates are lined up in a neat row above my mall. Hmm, but I’m feeling kinda lonely shopping alone. I want friends to come with me. Want to be my shopping friend? If you sign up also, we can add each other as friends and send each other messages and see each other’s status and all that. I think I want to buy this item but I’m a little undecided. If you’re my Jipaban friend, you can help! You need to come vote Yes or No for this item! If there are enough Yes votes, I’ll buy it! So cool, right? 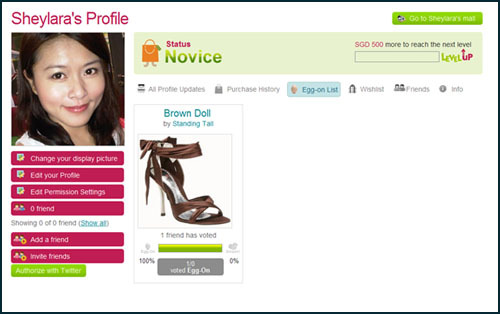 We can go virtual shopping together! Alright, I need to shop more because I want to level up! I’m currently a Novice shopper. I wonder what’s the next level. Ahhh, this is too fun. Save me! My bank account hates me! Wait, I have an idea. I need to make some money to pay for all my shopping, right? How about I sign up as a retailer, too!! I can rent a shop space on Jipaban and sell stuff! It will be fun! Like starting a blogshop but without the trouble of creating a website and promoting it. 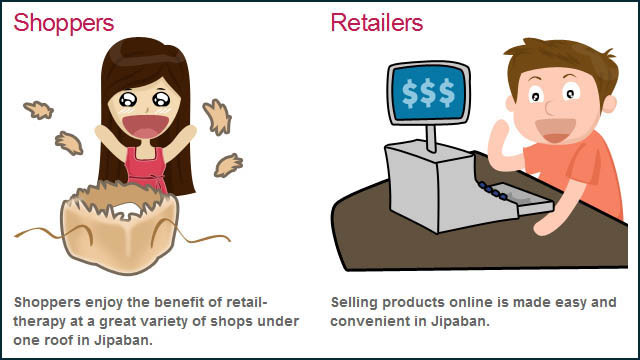 Jipaban does its own advertising and marketing so Jipaban shoppers will become my shoppers when they search for relevant products! Hehe. 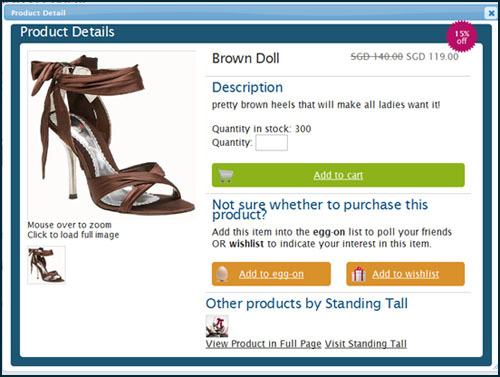 Well, okay, I don’t have anything to sell right now but I’m quite impressed by the features available to shoppers. I’ll be able to customise the appearance of my shop, send out messages and updates to my fans (who will have added my shop in their malls) and view my shop stats to see how I can improve things. Definitely better than starting my own blogshop! You know what the name Jipaban means, right? For foreigners, Jipaban is Hokkien for “one million”. It’s also the name of a local song about a local boy aspiring to be a millionaire. Um, I suppose my first step would be to think of something that would be fun to sell. LOL. 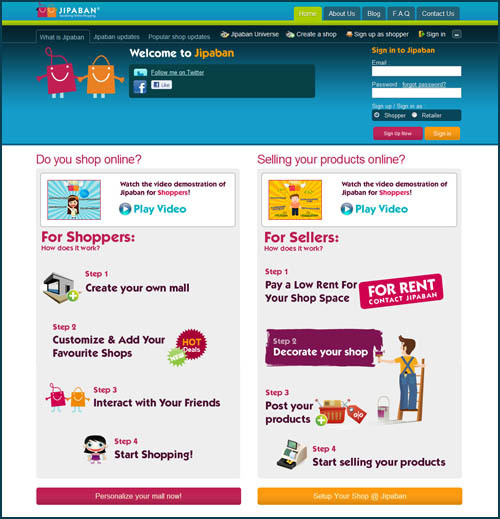 Anyway, whether you’re going to be a shopper or retailer or both, let’s be friends on Jipaban! Anchor tenants BonitoChico, Ohsofickle, Ohmymuffins, Access-ed and SingTelShop are waiting to welcome you! Well, if you have a minute now, why not check out these two cute videos? Really very cute! Oh, yes. Jipaban is on Facebook too. You can join here. 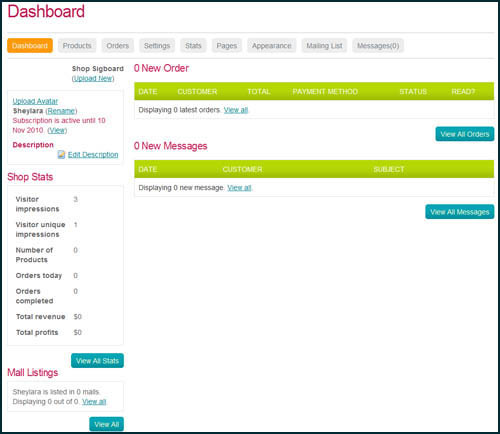 Hi, do you know if shipping and handling is done by Jipaban or the individual blogshops? I visited the site couple of times, but just get bored of it after 5 minutes. I think it’s just my curiosity. I visit cause it’s from nuffnang, have high hope, but the product is so so nia. looks cool! I’ll buy your products! haha! Did the problem happen continuously or was it just a one time occurrence? Browser crashes happen to all of us for all sorts of reasons, but rest assured that the Jipaban team is spending every day fine tuning our system! If the problem keeps happening to you, please do contact us at our site’s helpdesk! Thank you all for your patience and hope that you people enjoy the site! this seems so great. i can’t wait to make my own mall. let’s go shopping. this is such a great idea. thanks.